Here is my collection so far. Given the quality of the work and your great customer service, I see a couple more knife orders in my future. That Scourge handle on the Mutiny is incredible! The knifes balance and it’s hybrid handle work so well together it’s almost impossible to put down. I gotta say though....the Salyani is my absolute favorite. Such a light blade, and it’s balance makes it so fast and easy to control! Please give a big thanks to Tilak (I think it’s him from the makers mark) for the knife craftsmanship...and also thank the gent who makes your Kydex sheaths, they are very nice too!" 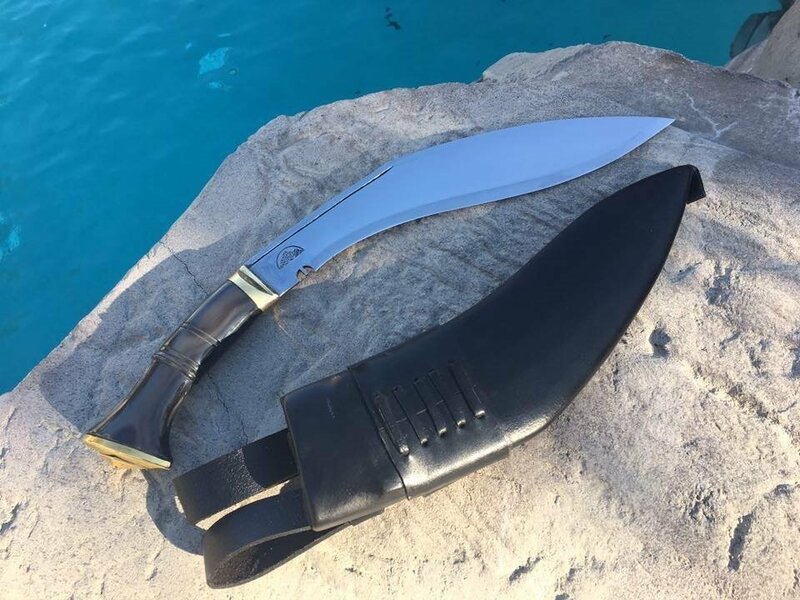 "Just received a package from Kathmandu with this awesome Khukuri made by the skilled Nepali craftsman at kailashblades. 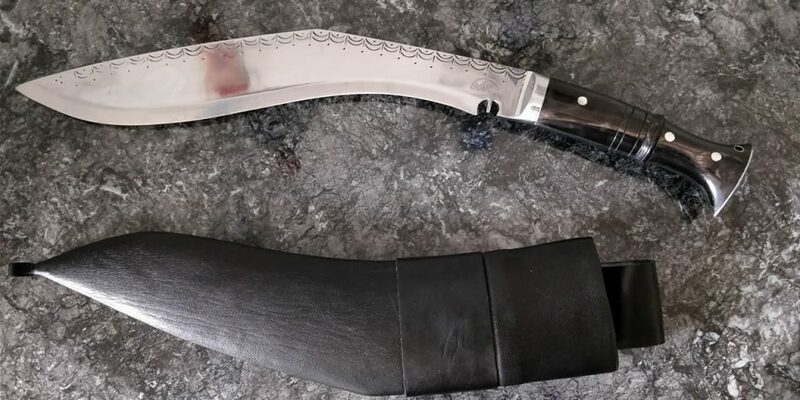 This is the first non-vintage traditional Khukuri I've purchased, the rest in my collection being anywhere from 50 to over 100 years old. This is an exceptionally well-balanced and lightweight (16.4oz/465g) piece. Hollow-forged 13" blade with a convex edge, distally tapering to a sturdy tip. Balances on the edge 1.5" in front of the Cho. "The Mutiny Khukuri arrived today in good order. What a beautiful and well balanced blade. "Wow! Love my MK-1 Centenary that DHL dropped off today. What a great piece of craftsmanship! Thanks to your entire team for the effort!" 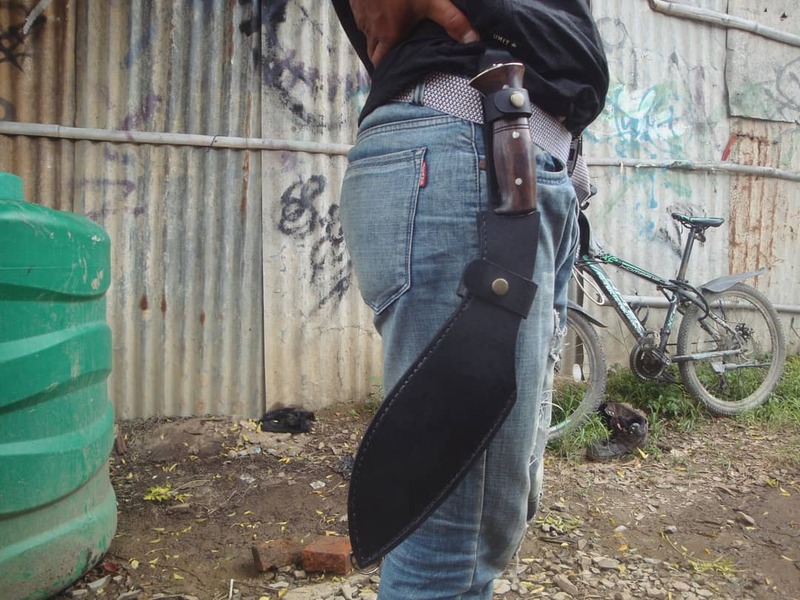 "Got this monster blade from Kailash blades. It's called a bush cleaver, but no matter where you choose to use it, it's definitely a cleaver! I needed something to split this sheeps head and the cleaver cut it neatly, and very cleanly in two perfect halves. You can't get a cleaner cut than that! The blade is also still just as sharp. As Doug Marcaida would say, It will cut!"  "I wanted to take a moment to thank you for your help. It is such a nice change from the (sadly) normal modern customer service. Happy Holidays and I really dig your picture on the Kailash Blades website. "It's perfect! Handle is spot on. Thank you. BTW both khukuris had spots on the blade from the oil that I couldn't remove without using Flitz. Not a big deal, just giving you a heads up. I'll get photos of the first version next week. I couldn't be happier with this one." Tell the guys job well done, I appreciate the effort and would surely recommend your business to all my friends. 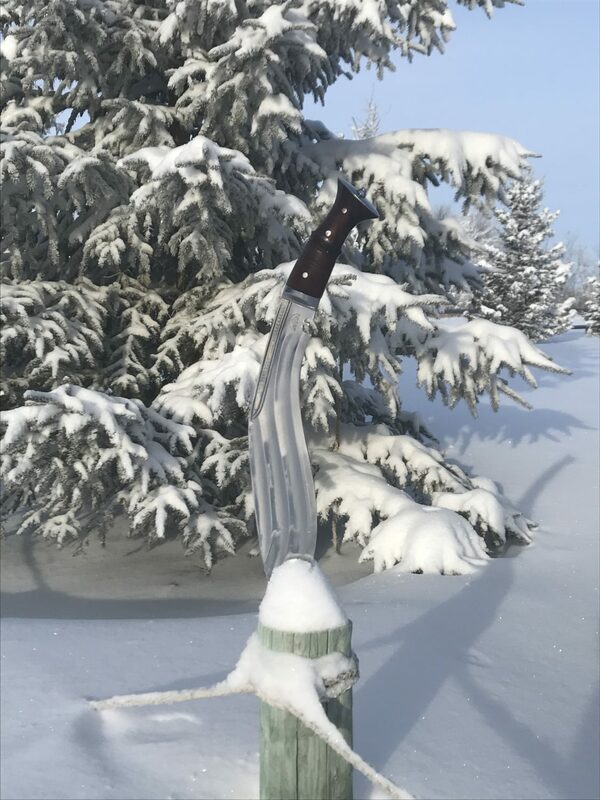 "Just got this Bad boy from Kailash Blades! 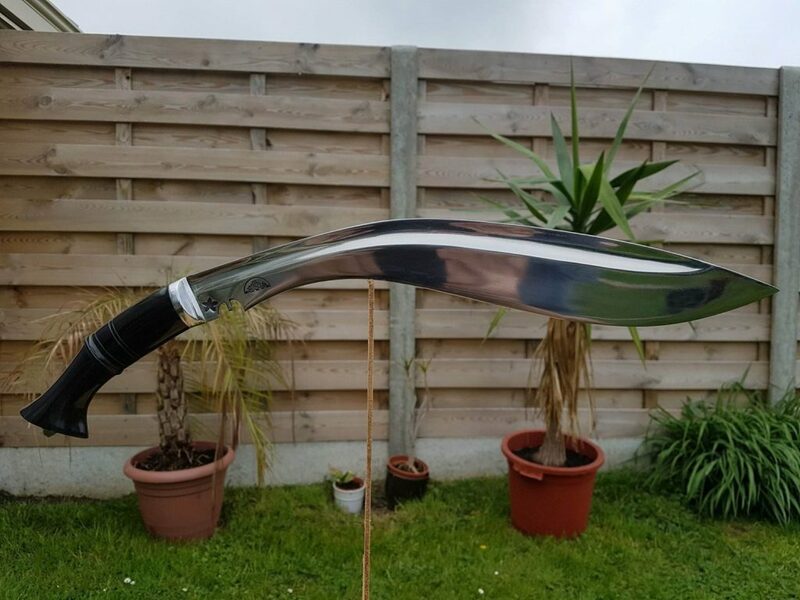 It's a custom panawal khukuri. I Can't say anything else other than amazing Job. It have 13" blade and weights somewhere between 600-750grams.  If you are interested some high quality blades i recommend to check them out!" "When I go timber hunting, this is what I carry. A lot of guys use a small camp hatchet for forest axe, but i prefer this Kukri. Its a modified Mutiny made by Kailash Blades, called the Green Mountain. When timber hunting, there are tons of uses for a blade. Stripping off bark to get a good look at the grain, you can also get a feel for how interlocked the grain is by the level of resistant from a strike parallel to the grain. 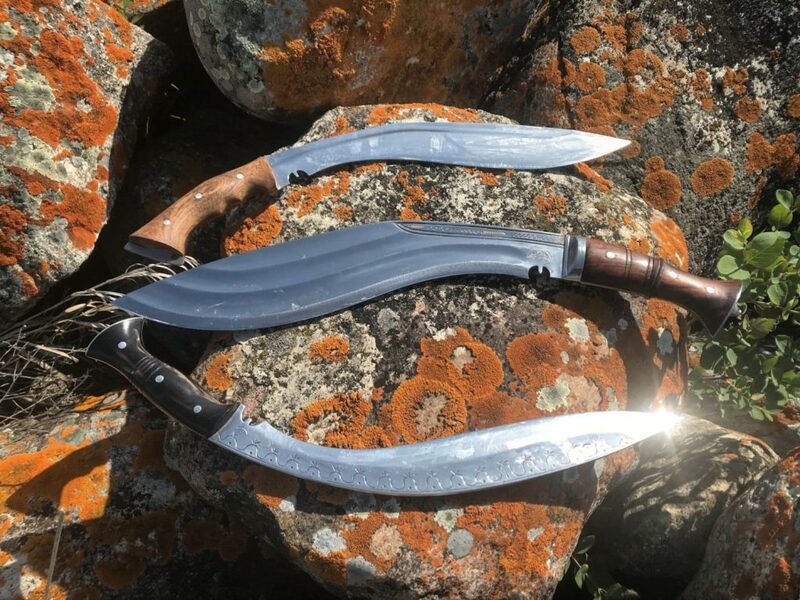 Here in the Santa Cruz mountains, there is also a lot of dense underbrush from mimosas, wild fennel and oak sapplings, and i find the thinner and sharper curved kukri blade functions a lot more like a machete for getting through thick brush. It's also a lot lighter. The Green Mountain design the guys at Kailash made for me is ground well with extra fullers to further reduce weight. I'd say im a fan." 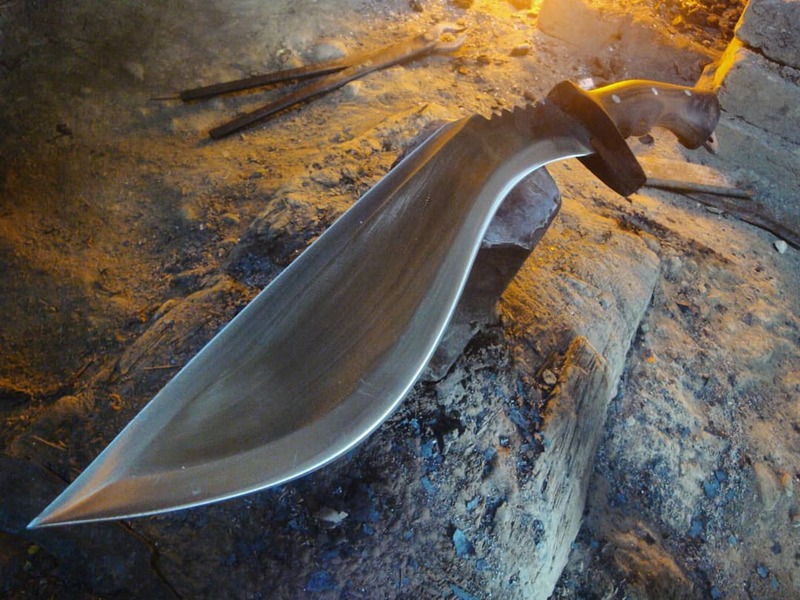 "Got this little beast made for me by the good people at Kailash Blades in Nepal. If you like a good knife, definitely check em out. 5160 steel and buffalo horn." "Hey, I got a part time job cutting trails! All I'm using right now is the Kukri. I'll send a photo of the trail soon. But it's through thick acacia, nettles and oak saplings. The blade is doing awesome." "This HSI is light and fast in the hand and makes for a great choice to take on a backpacking trip or on a day hike. Kailash Blades put some thought into making this HSI. The choice of Horn truly appears that they carefully selected the best samples of buffalo horn they could find with such a beautiful grain pattern. The fit and finish to this overall kit is top notch, absolutely flawless. 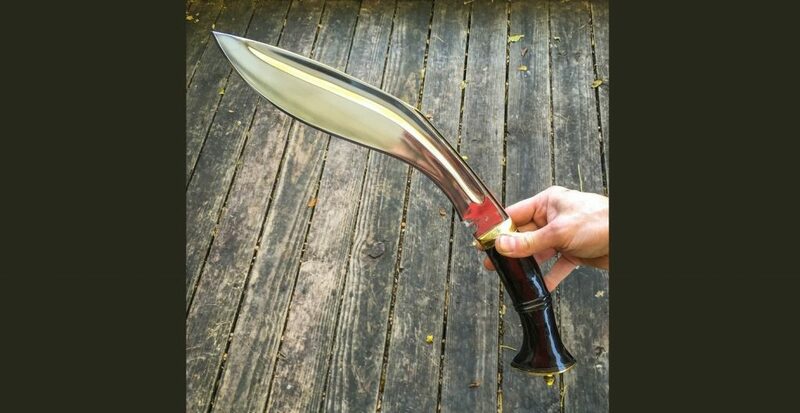 Honestly I believe the Gurkhas in service today would not hesitate carrying this as their standard Issue Khukuri. This is an excellent choice for anyone wanting an accurate historical BSI that can be used in the field with confidence." To be honest it is a bit heavier that I expected, but that’s no problem...now that I’ve used it a bit, I understand it’s concept of ops and will proudly use it often around my acreage...this blade wont be a display case debutante. Here are some pics I took to send you guys. Your pics are great, they have such lush green backdrops and are held by dudes in shorts. However, my reality is a bit different so I thought I’d send you back some pics of my -39c day outside (-50c with a windchill) to give you a sense of how your masterpiece is going to be used for the next 30 years. I’m trying to decide on my next one. The pictures of the sheaths you sent are very helpful, thanks! Your sheath craftsman did a phenomenal job on the kydex I purchased, but the western leather versions look really well made too. I guess I have some tough choices ahead." "Well my anniversary present has arrived and I'm over the moon! Thank you Kailash Blades for a great blade and wonderful customer service and pretty quick too! I will definitely be ordering again in the future from them. Now to go chop something! Look out yard here I come! Took my JD Pensioner kukri by Kailash Blades out back. I chopped into my old cherry tree like I was testing for a TV show and I got to say I'm even more impressed with this knife. It went into the wood so easily and deep throwing out large chips. It's still just as sharp as the day it was sent with absolutely no edge damage. 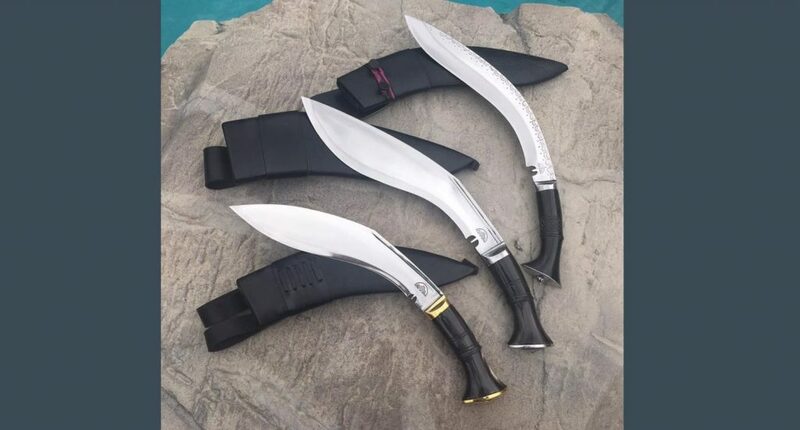 If you want a great kukri they offer quite a few styles and sizes along with other styles and are all hand made in Nepal." I received all three khukuris today. They arrived in perfect condition and the shipping was extremely fast. Thankyou. All three blades are amazing and very beautiful and I am very, very pleased. 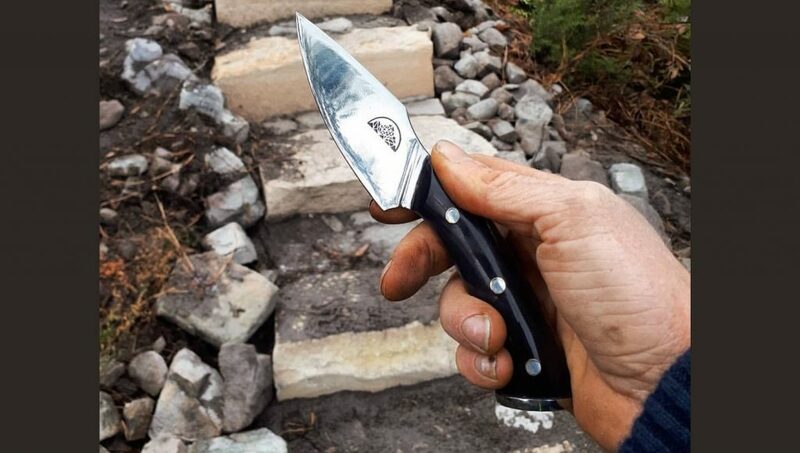 They are perfect to take hiking or backpacking and to keep with my bugout gear. The selection of Buffalo horn on each one is so gorgeous on each one. You guys are Master Knifemakers. Thank you so much. 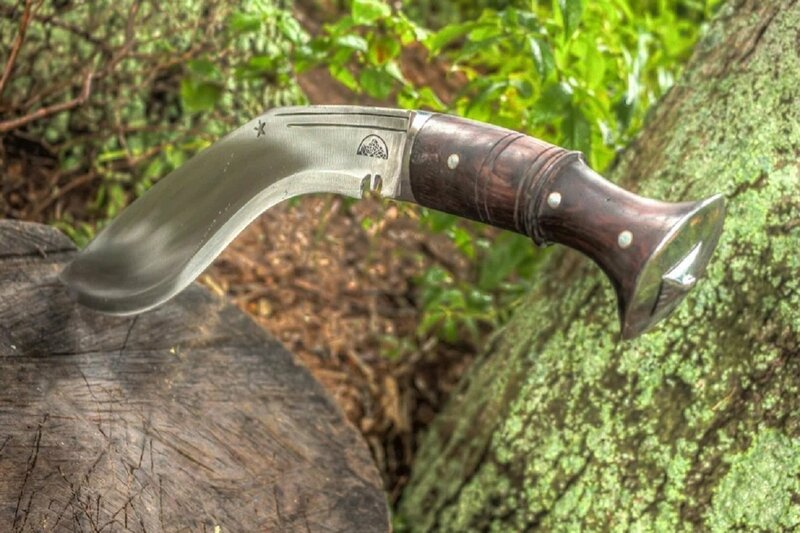 I'm already picking out the khukuri I want on my next order. For sure one will be the Mutiny and the other will be the Pensioner, perhaps one more. Again, thankyou. You guys knocked it out of the Ball Park! Home run! For more in depth reviews and discussion of our blades, check out these examples from elsewhere on the web. Joerg Sprave from the Slingshot Channel is an old friend of Andrew's and he put our Knout through it's paces for us. As usual he didn't go easy on it and sent it through wood, coconut, aluminium and steel without any edge damage. He also loved the solidness of our Western Leather Sheaths. It's worth nothing that this review is for an older version of our Knout, with the newer version having updated ergonomics and an even faster feel in hand. Joerg Sprave from the Slingshot Channel is an old friend of Andrew's and he put our Knout through it's paces for us. As usual he didn't go easy on it and sent it through wood, coconut, aluminium and steel without any edge damage. He also loved the solidness of our Western Leather Sheaths. It's worth nothing that this review is for an older version of our Knout, with the newer version having updated ergonomics and an even faster feel in hand. Chris Thorne from DropForgedSurvival gave our Scourge Anniversary an extremely thorough and direct product review. He cleared brush with it, split wood, felled trees and even went through some femur. He was stoked with it and so are we. Note the contours and the looks of the redesigned Scourge handle. Chris Thorne from DropForgedSurvival gave our Scourge Anniversary an extremely thorough and direct product review. He cleared brush with it, split wood, felled trees and even went through some femur. He was stoked with it and so are we. Note the contours and the looks of the redesigned Scourge handle. The Guys at Honest Knife Reviews have bought a few knives off us over the years, but this M43 Martial stands out by virtue of being a custom. A two toned handle and Electrochemical engraving really helps this guy stand out from the pack. They dug the custom process and absolutely loved the blade, plus we took their feedback on board and now ship all of our kydex sheaths with Nyloc Nuts. The Guys at Honest Knife Reviews have bought a few knives off us over the years, but this M43 Martial stands out by virtue of being a custom. A two toned handle and Electrochemical engraving really helps this guy stand out from the pack. They dug the custom process and absolutely loved the blade, plus we took their feedback on board and now ship all of our kydex sheaths with Nyloc Nuts. 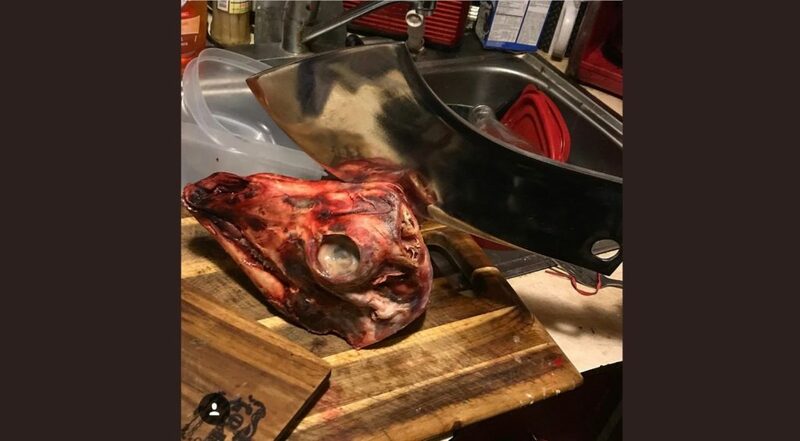 Here's a great ongoing thread on Maryland Shooters where people talk about their experiences ordering with us, custom pricing and more importantly, talk about how much they're enjoying their knives from Kailash Blades. A snippet of a larger thread here where a customer shares some views on the ordering process as well as the finish function of the HSI compared to other khukuris. Here's a few text reviews of our blades. The first of which is a thorough long term writeup of that same M43 Martial which they reviewed previously. These are handful of long term reviews by 12 Gauge Chimp on our 16" sirupate as well our Scourge Khukuri. It's worth noting that this review is of the older version, with out current blade having a western leather sheath as standard, improved geometry and ergonomics as well as refined balance. 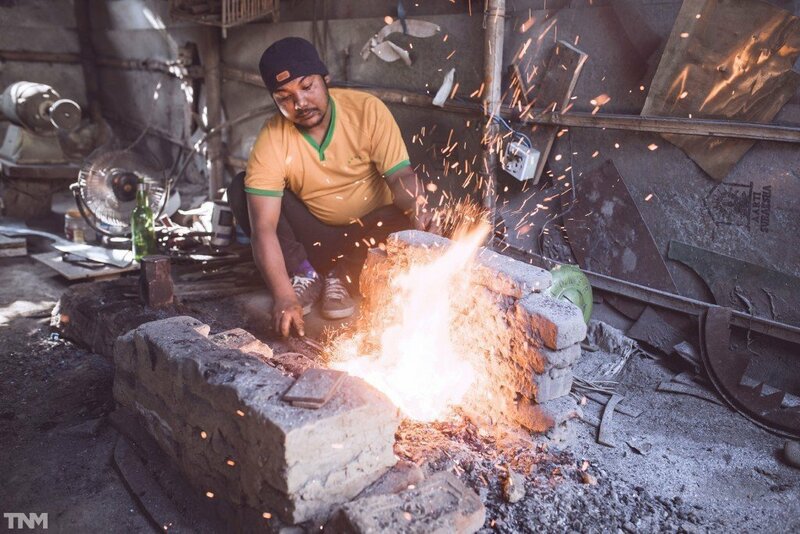 We were recently lucky enough to have received a feature article in The Nepali Man, a very popular men's lifestyle magazine. There's some beautiful photos in it of our knives, the team as well as some great information about what we're about and why we do what we do.